Northwest living and adventure can be found at the Indian Valley Retreat along Indian Creek. This gorgeous property with its meandering trails, serene sitting areas, and babbling voice of Indian Creek create the perfect setting for a family or couples retreat. Take in a glass of wine with dinner on the expansive deck overlooking the creek and surrounding property. Enjoy the community fire pit alongside the creek that beckons for S'mores and campfire stories. Lots of open space for playing yard games or throwing a ball around. Beautifully decorated and arranged, the inside of this family retreat offers three bedrooms and 2 1/2 baths. The well-appointed kitchen is ready for you to whip up a meal and the Living room has a large sectional to accommodate everyone for movie night. Perfect location for families looking to take day adventures throughout the Olympic National Park, west end beaches and nearby Lake Crescent. Just a short drive east into downtown Port Angeles for quaint coffee shops, bistro pubs and local seafood dining. 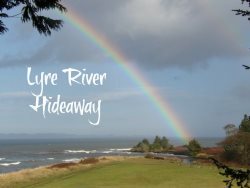 Can be rented with the Indian Creek Cottage and Elwha Place for family reunions sleeping up to 15 total guests. Inquire with booking agents for availability. ***Please note that the nightly rates for this property are based on 4 guests; there is an additional nightly guest fee per person up to 7 guests max. They were super pleasant. Couldn't have asked for more, great people to deal with. They made everything super easy and everything went smooth. Lovely property. Made our vacation amazing; The huge deck was great for bbq and provide a great view of the river. Friendly, knowledgeable, great customer service. It was my second time to stay at this property and I would love to stay a third time. Love the location and grounds. Very clean house with everything you need to feel at home. Team members were great! Very helpful at check-in, answering questions during our stay, and making check-out simple. Thanks!! Great experience from start to finish! Description on website was complete and accurate, sign-up process was smooth and timely, check-in was a snap, and the property was just as described. Plus, communication of questions to B-S Vac Rentals was easy and responses were quick. Very pleased all around. Great location to access Olympic National Park. Quiet at night. Enjoyed sitting on back deck and the gurgling creek! It was such a great stay! I'm so glad we found this place. We decided on a whim to head to the North West Olympic Mountains. The obvious choice was west of Port Angeles, which is right in the center of everything. This house had it all, not only in a beautiful setting, it was well equipped. Three bedrooms with two and a half bathrooms worked well for us. It is private in a wonderful country setting, but still has wifi/cable which is a great bonus being in the country. Granny's cafe is 1 to 1.5 miles away, which is also amazing. Robes, wine, beer, granola bars and wifi, which is included in the price, is awesome. Thank you Indian Valley Retreat! We will stay here again.